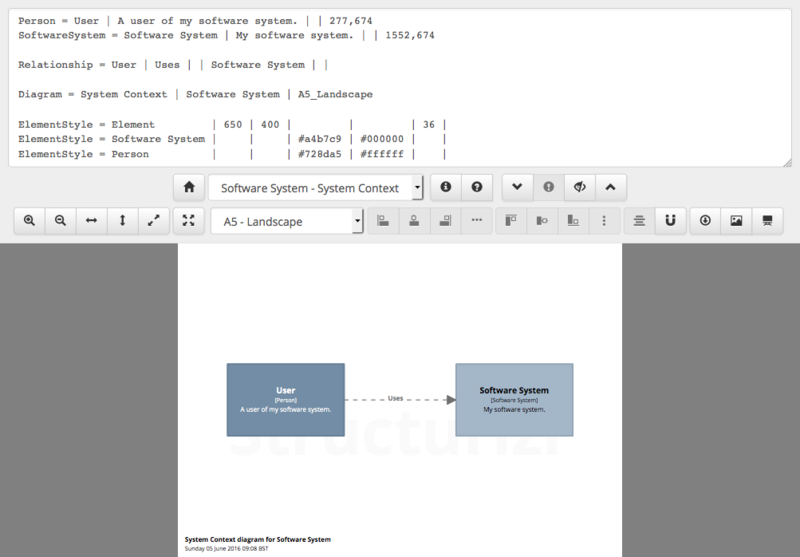 I rolled out a new feature to Structurizr at the weekend called Structurizr Express, which is basically a way to create software architecture diagrams using text. Although the core concept behind Structurizr is to create a software architecture model using code, there are times when you simply want a quick diagram, perhaps for a presentation, pre-sales proposal, etc. Structurizr Express will let you do just that - quickly create a single software architecture diagram using a textual definition. Much like tools such as PlantUML, yUML, WebSequenceDiagrams, etc. Despite the name, this is all still based around the C4 model although it only targets one diagram at a time. The three types of diagrams currently supported are System Context, Container and Component diagrams. Structurizr Express is available to use now and the help page provides a description and examples of the syntax. I hope you find it useful.